An eagle circled overhead as the statue of Edward Cornwallis came down Wednesday in Halifax. For hours members of the Mi’kmaq community and others watched as workers sawed and hammed away at the feet of the bronze statue erected almost 90 years ago to commemorate the city’s founder. They cheered when a crane lifted the large bust off a stone pedestal and onto the back of a truck to be taken away and put into storage indefinitely. Workers spent hours cutting and chipping away at the bronze statue in an effort to separate it from the stone pedestal it was placed on. In a 12-4 vote on Tuesday Halifax Regional Council voted to immediately remove the statue and continue with plans to form an expert panel that will include appointed Mi’kmaq representatives to determine the fate of the controversial statue. Cornwallis issued bounties on Mi’kmaq scalps in 1749 and 1750 while establishing a barracks at Halifax. For at least three decades Mi’kmaq have called for the statue’s removal, many arguing that a man who incited genocide against their ancestors should not be publicly celebrated, and that the statue’s prominence in downtown Halifax is a constant reminder of the pain, suffering and colonization endured by Mi’kmaq for hundreds of years. Tensions rose last July after five Canadian military personnel identifying as members of the Proud Boys interrupted an Indigenous mourning ceremony at the Cornwallis statue. Many Indigenous-led ceremonies and protests in recent months and years have been met with public displays of racism by settlers who some say reject facts and narratives that challenge Eurocentric perspectives of Canada’s history. 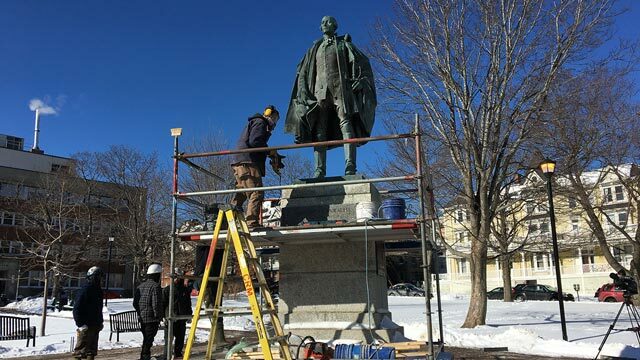 Council’s decision to remove the statue came days after the Assembly of Nova Scotia Mi’kmaq Chiefs announced it was pulling its support for the establishment of the panel to review the city’s commemoration of Cornwallis. The chiefs said the process of forming the committee was taking too long. After years of debate and previous votes against removing the statue, on Tuesday some Halifax councillors admitted changing their position on the matter after researching Mi’kmaq history and reading the 2015 Truth and Reconciliation Commission report. “I look at the 500 years of broken promises since Europeans first arrived and settled on these shores. And those 500 years have been rife with disease, strife, broken treaties, broken promises, hidden agendas, military action — and circumstances which beggar the imagination to the point where a true decimation occurred in North America,” Councillor Richard Zurawski said in an impassioned speech. Following the vote Assembly of First Nations Regional Chief Morley Googoo said he hopes other municipalities across Canada are paying attention. 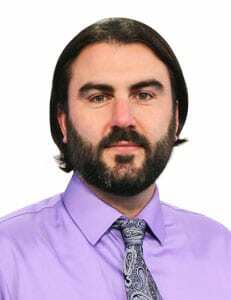 “I think there’s a huge opportunity here for the City of Halifax to show how other municipalities across the country are dealing with the very same question, about how do they have relationships with Indigenous people,” he said. 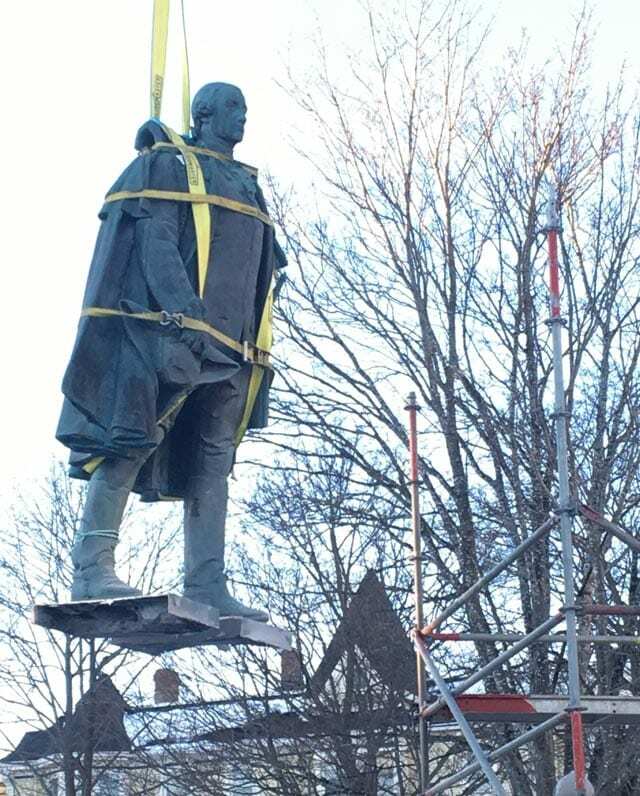 The statue of Edward Cornwallis is hoisted by a crane and placed on the bed of a truck before being taken away and put into storage. In the coming months an expert panel that will include members of the Mi’kmaq community will discuss the statue’s future. By the end of the day Tuesday posters appeared on benches and light poles in the statue’s vicinity at Cornwallis Park. 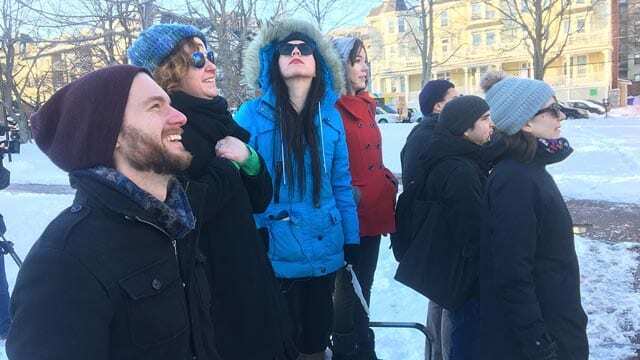 They read “Save Our Statue” and contained a QR code linking to a Facebook community page that contains comments denying genocide ever occurred against the Mi’kmaq. By Wednesday morning the posters had been removed, and there were no protests or visible dissent during the statue’s removal. Rebecca Cope-Moore (centre) looks for an eagle soaring above as others watch workers remove the Edward Cornwallis statue in Halifax Wednesday. 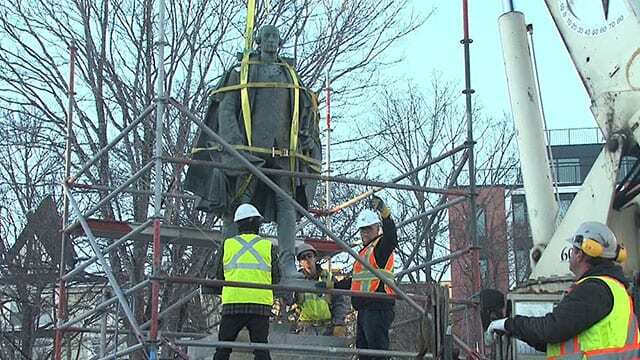 Rebecca Cope-Moore, a Mi’kmaw activist and member of Pictou Landing First Nation who has long advocated for the statue’s removal, said it was “surreal” to watch Cornwallis come down Wednesday. A seventh-generation descendant of former Mi’kmaw leader Jean-Baptiste Cope, a signatory of the British-Mi’kmaq 1752 Peace and Friendship treaty, Cope-Moore said she felt she was watching a prophecy unfold. Rebecca Cope-Moore, member of Pictou Landing First Nation, describing the moment when an eagle flew over the area as the Cornwallis statue was being removed. “I was here to witness that moment along with my sister and lots of community members. And when Cornwallis came down an eagle flew over—right over all of us—and that’s not common here in the city to see them too often,” she said. Halifax Regional Council will now continue its effort to form the expert panel to review the city’s commemoration of Cornwallis and to make recommendations on what to do with the statue.